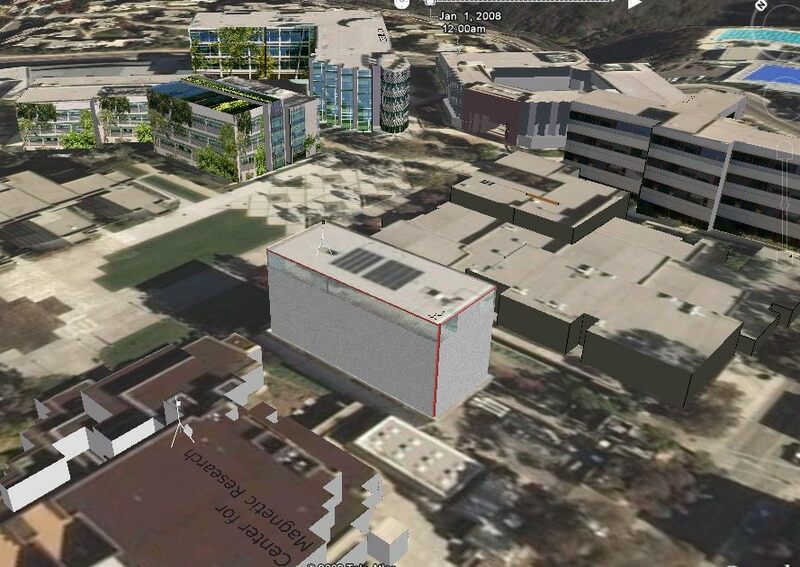 Fly through the UC San Diego campus and view my wireless sensor network. Artificial Turf and urban energy use. A contribution to Voice of San Diego. Kleissl's students critical in bringing $154 Million in Clean Renewable Energy Bonds to San Diego to build 20 MW of solar PV projects. My research group works in Environmental Fluid Mechanics and Solar Radiation in the atmosphere through field experimental (scintillometry, sky cameras, sensor networks) and computational techniques. The research is unique in that it spans the spectrum of fundamental work to applications with the goal of increasing environmental sustainability. 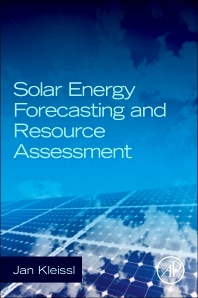 Sample applications are energy conservation through urban heat island mitigation, and solar power resource forecasting, variability modeling, and grid integration. 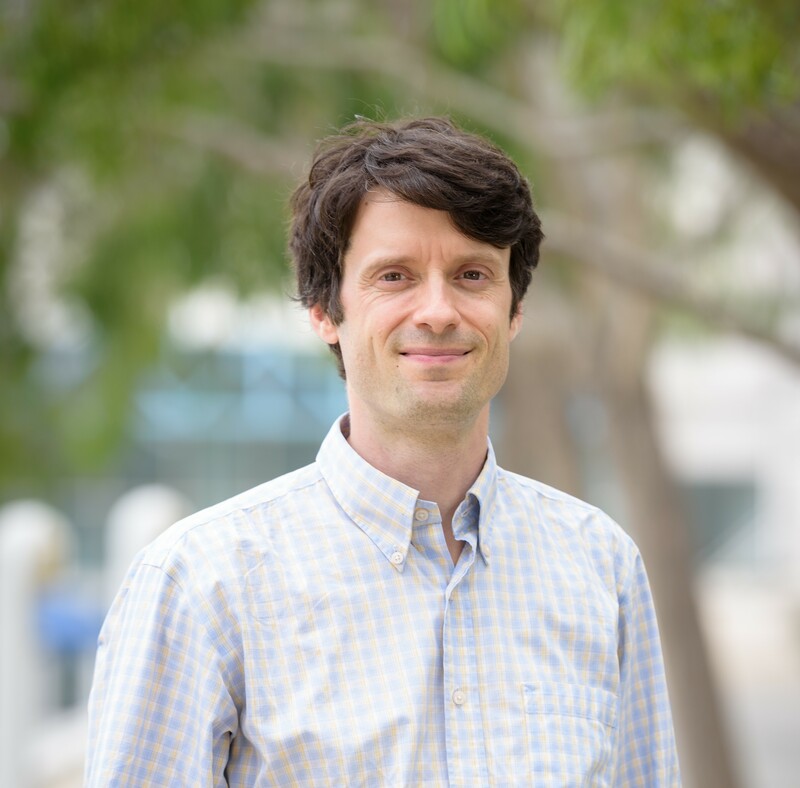 Student mentoring is my priority: My students present regularly at national and international conferences, have received fellowships from NASA and NSF, and collaborate with NREL, Sandia, and Lawrence Berkeley National Lab on research projects. Please contact me if you have any questions. 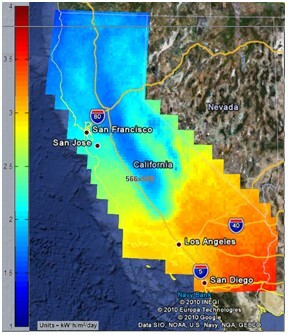 The map on the right shows a screenshot of our Google Earth Map global horizontal incident solar irradiance for the state of California. Save this file as .kmz and open in Google Earth. 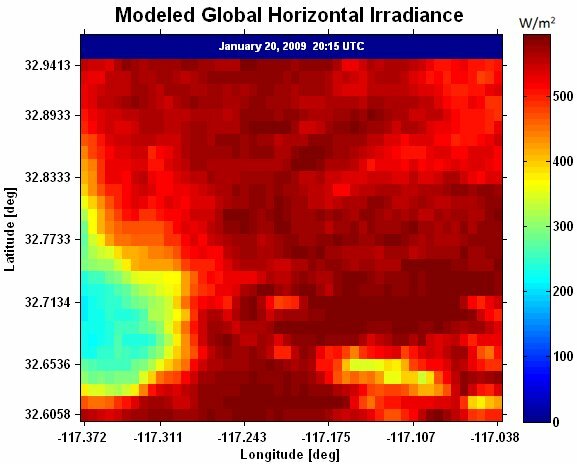 Satellite remote sensing models (top left), numerical weather prediction (bottom), and ground sensors (top right) are used to provide solar forecasts for time horizons from 10 minutes to 72 hours. The map on the top left shows GOES satellite GHI [W m-2] for the San Diego area at 1 km resolution. Clouds (east half) cause a substantial reduction in GHI. The coast is visible due to satellite navigation errors. Cloud motion vectors are applied to forecast the movement of the clouds. North American Model (NAM) output from the National Weather Service is shown on the bottom left for a storm system moving through California. 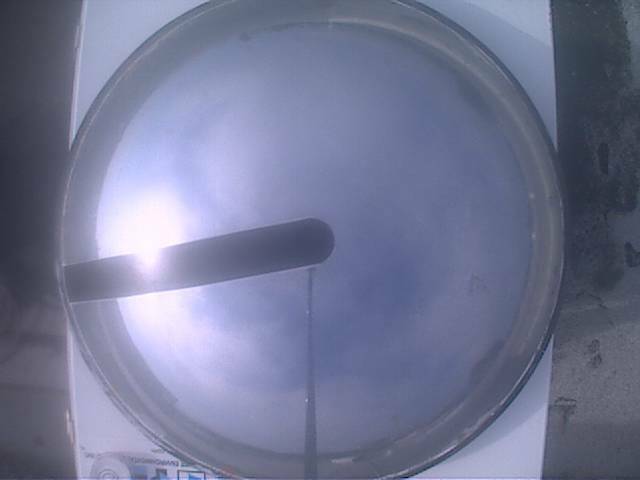 At the UCSD campus advanced sky imager technology is applied to get a fine-grained picture of local clouds. 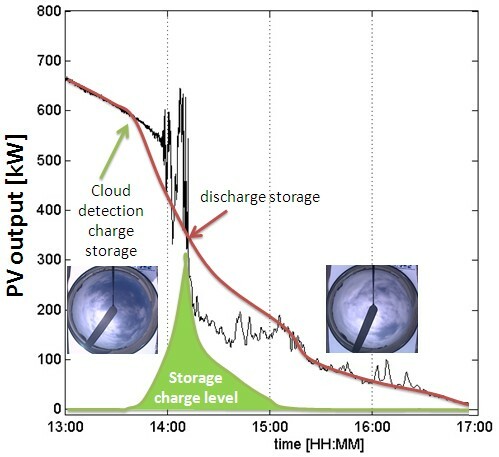 Real-time images of the La Jolla skies produce solar output forecasts for 1 MW of dispersed solar PV that will be utilized by a microgrid scheduler/optimizer to enable supply, storage and load adjustments based on dynamic market price signals (lower right). 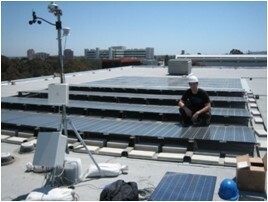 Increasing energy efficiency is a primary objective for achieving energy independence and environmental sustainability. Buildings consume 40% of total US primary energy and 72% of electricity, a large fraction of which is used for heating, ventilation and air conditioning (HVAC). Higher urban temperatures caused by the urban heat island (UHI) effect increase the energy use for cooling in a positive feedback loop. 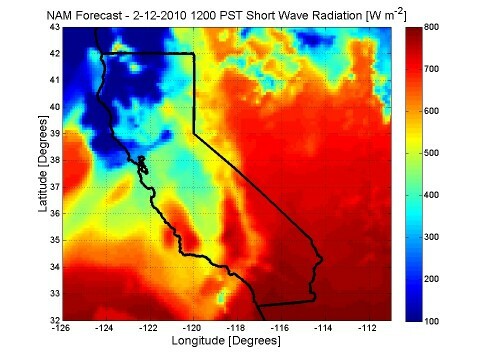 UHIs also impact meteorology (sea breeze), air quality (Ozone smog), and public health (heat wave mortality). The US Climate Change Science Program determined that climate change will exacerbate the intensity of the UHI and recommended that spatial extent and diurnal changes of the UHI be evaluated at fine spatial scales. Quantification of UHI causes and effects at fine spatial scales can inform green engineering strategies (such as reflective roof coatings, solar panels, artificial turf, and urban forests) to improve the existing building stock and to create energy efficient communities. Understanding heat transfer between buildings and the environment is considered to be one of the key elements in the design of strategies that can help reduce energy consumption of an urban area. 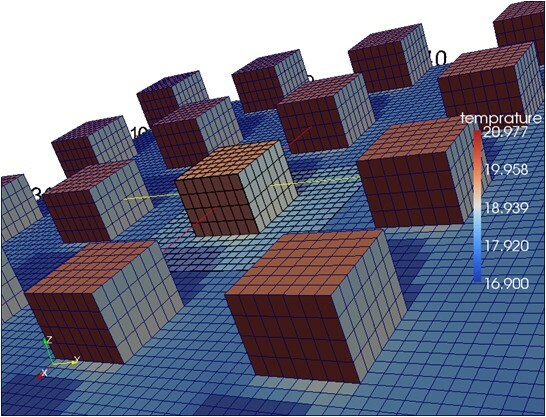 We run 3-dimensional models (top, left) that take into account meteorology, building and ground materials, and building operation modes to determine the urban thermal environment and building energy use. 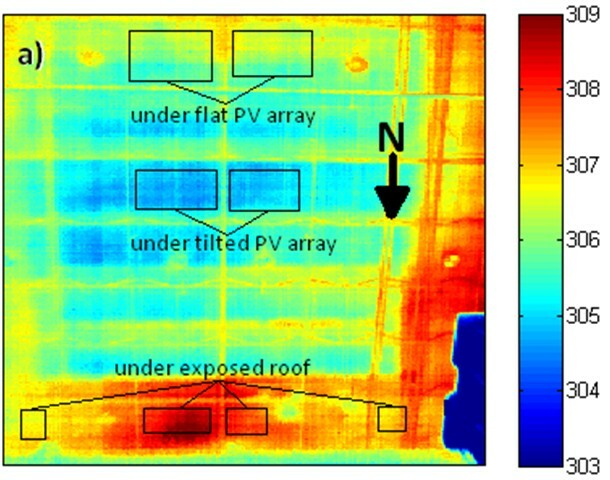 In a measurement study we found that solar PV panels dramatically reduce the roof cooling load as evident in a thermal infrared image of the ceiling of a building with partial coverage of solar PV (far left).